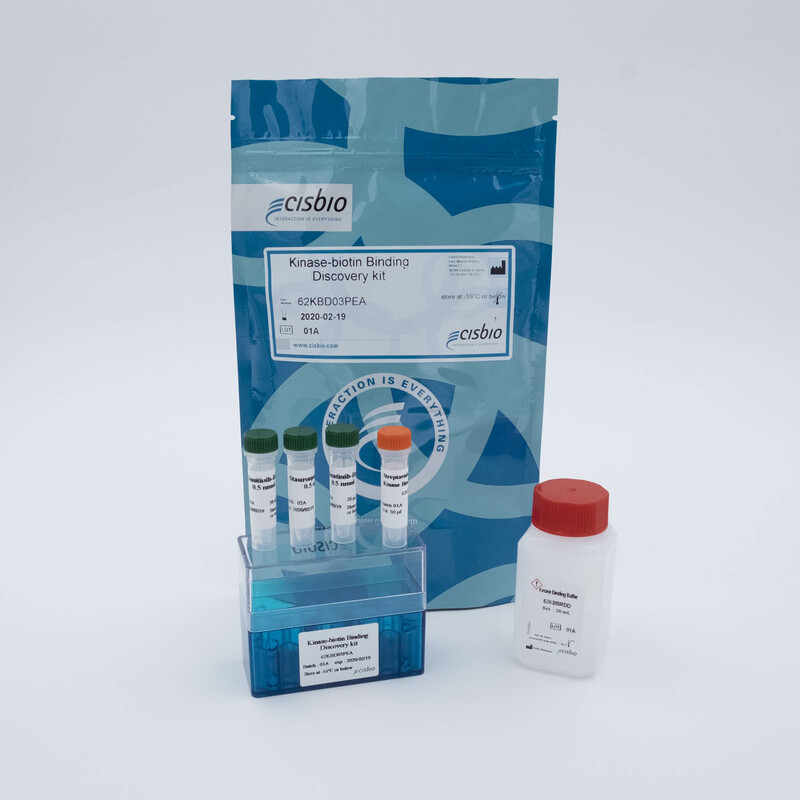 This kit is intended for the quantitative measurement of the dissociation constant (Kd) of three different tracers (Staurosporine-Red, Dasatinib-Red and/or Sunitinib-Red) on N-terminal biotinylated kinases, using HTRF® technology. ​The best known kinase inhibitor, Gleevec (Imatinib), binds a non-activated form of Abl. Such inhibitors are therefore more difficult to detect using activity based assays, so it is worthwhile to set up kinase binding assays for your kinase of interest in order to avoid missing out on such compounds. 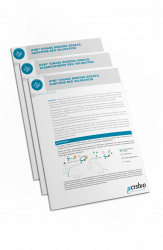 Moreover the HTRF® kinase binding assays are easily set up, using a mix and measure detection format in the absence of ATP. Direct displacement of the fluorescent-inhibitor from the ATP binding pocket is measured, enabling the determination of the affinity of your inhibitor by performing dose response curves. 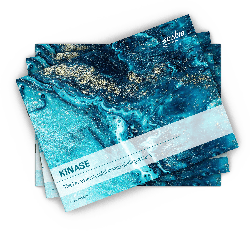 Purified kinase preparation is less critical compared to enzymatic assays, since measurements can be performed on kinases which have little or no activity. The binding of the tracers is detected in a sandwich assay format using a specific streptavidin labeled with Europium Cryptate (donor), which binds to N-terminal biotinylated Kinase, and a red fluorescent tracer labelled with d2 (acceptor). The HTRF ratio (665/620) will increase upon the addition of more of the tracer, and will saturate depending on the dissociation constant (Kd) of the tracer to the N-terminal biotinylated kinase . The Kinase-biotin binding Discovery Kit helps determine which tracer might be best suited to setting up a binding assay. The tracer with the best assay properties (depending on the Kd and assay window generated) will be chosen to perform competitive binding assays. Saturation binding experiments on the three tracers (i.e. Staurosporine-Red, Dasatinib-Red, and Sunitinib-Red) can be run on 96- or 384-well plates (20 µL final volume). First, a dilution series of tracer ranging between 0 and 1 µM in the Kinase Binding Buffer is prepared in a 96-well non-binding plate. Next, 5 µL of Kinase Binding Buffer are dispensed into the final 96- or 384-well plate. Then 5 µL of N-terminal biotinylated-Kinase are added, followed by 5 µL of Streptavidin Eu-cryptate. Finally, 5 µL of the red tracer solution are added. Streptavidin-Eu cryptate is used in HTRF Kinase Binding assays.